Not to be confused with Desert. For other uses, see Dessert (disambiguation). Dessert (/dɪˈzɜːrt/) is a course that concludes an evening meal. The course usually consists of sweet foods, such as confections dishes or fruit, and possibly a beverage such as dessert wine or liqueur, however in the United States it may include coffee, cheeses, nuts, or other savory items regarded as a separate course elsewhere. In some parts of the world, such as much of central and western Africa, and most parts of China, there is no tradition of a dessert course to conclude a meal. Rajbhog - variant of kesar rasgulla stuffed inside with dry fruits and khoa from India. Laddu is often served on Indian festivals such as Raksha Bandhan and Diwali. 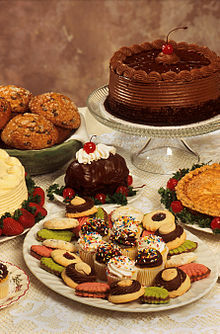 The term dessert can apply to many confections, such as biscuits, cakes, cookies, custards, gelatins, ice creams, pastries, pies, puddings, and sweet soups, and tarts. Fruit is also commonly found in dessert courses because of its naturally occurring sweetness. Some cultures sweeten foods that are more commonly savory to create desserts. The word "dessert" originated from the French word desservir, meaning "to clear the table." Its first known use was in 1600, in a health education manual entitled Naturall and artificial Directions for Health, written by William Vaughan. In his A History of Dessert (2013), Michael Krondl explains it refers to the fact dessert was served after the table had been cleared of other dishes. The term dates from the 14th century but attained its current meaning around the beginning of the 20th century when "service à la française" (setting a variety of dishes on the table at the same time) was replaced with "service à la russe" (presenting a meal in courses.)" 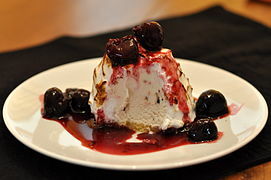 The word "dessert" is most commonly used for this course in Australia, Canada, Ireland, New Zealand, and the United States, while "pudding", "sweet", or more colloquially, "afters" are also used in the United Kingdom and some other Commonwealth countries, including Hong Kong and India. The spread of sugarcane from ancient India to the world. 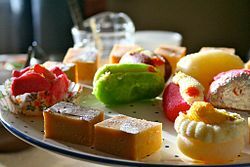 Some Indian confectionery desserts from hundreds of varieties. In certain parts of India, these are called mithai or sweets. Sugar and desserts have a long history in India: by about 500 BC, people in India had developed the technology to produce sugar crystals. In the local language, these crystals were called khanda (खण्ड), which is the source of the word candy. Sugarcane was grown and refined in India before 500 BC:26 and was crystallized, making it easy to transport, by 500 AD. Sugar and sugarcane were traded, making sugar available to Macedonia by 300 BC and China by 600 AD. In the Indian subcontinent, the Middle East, and China, sugar has been a staple of cooking and desserts for over a thousand years. Sugarcane and sugar were little known and rare in Europe until the twelfth century or later, when the Crusades and then colonization spread its use. Herodotus mentions that, as opposed to the Greeks, the main Persian meal was simple, but they would eat many desserts afterwards. Europeans began to manufacture sugar in the Middle Ages, and more sweet desserts became available. Even then sugar was so expensive usually only the wealthy could indulge on special occasions. 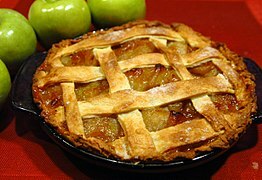 The first apple pie recipe was published in 1381. The earliest documentation of the term cupcake was in "Seventy-five Receipts for Pastry, Cakes, and Sweetmeats" in 1828 in Eliza Leslie's Receipts cookbook. The Industrial Revolution in Europe and later America caused desserts (and food in general) to be mass-produced, processed, preserved, canned, and packaged. Frozen foods, including desserts, became very popular starting in the 1920s when freezing emerged. These processed foods became a large part of diets in many industrialized nations. 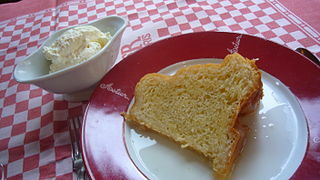 Many countries have desserts and foods distinctive to their nations or region. Sweet desserts usually contain cane sugar, palm sugar, honey or some types of syrup such as molasses, maple syrup, treacle, or corn syrup. Other common ingredients in Western-style desserts are flour or other starches, Cooking fats such as butter or lard, dairy, eggs, salt, acidic ingredients such as lemon juice, and spices and other flavoring agents such as chocolate, peanut butter, fruits, and nuts. The proportions of these ingredients, along with the preparation methods, play a major part in the consistency, texture, and flavor of the end product. Sugars contribute moisture and tenderness to baked goods. Flour or starch components serves as a protein and gives the dessert structure. Fats contribute moisture and can enable the development of flaky layers in pastries and pie crusts. The dairy products in baked goods keep the desserts moist. Many desserts also contain eggs, in order to form custard or to aid in the rising and thickening of a cake-like substance. Egg yolks specifically contribute to the richness of desserts. Egg whites can act as a leavening agent or provide structure. Further innovation in the healthy eating movement has led to more information being available about vegan and gluten-free substitutes for the standard ingredients, as well as replacements for refined sugar. Desserts can contain many spices and extracts to add a variety of flavors. Salt and acids are added to desserts to balance sweet flavors and create a contrast in flavors. Some desserts are coffee-flavored, for example an iced coffee soufflé or coffee biscuits. 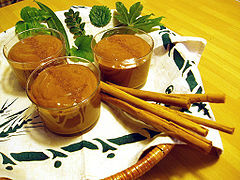 Alcohol can also be used as an ingredient, to make alcoholic desserts. Dessert consist of variations of flavors, textures, and appearances. Desserts can be defined as a usually sweeter course that concludes a meal. This definition includes a range of courses ranging from fruits or dried nuts to multi-ingredient cakes and pies. Many cultures have different variations of dessert. In modern times the variations of desserts have usually been passed down or come from geographical regions. This is one cause for the variation of desserts. These are some major categories in which desserts can be placed. Biscuits, (from the Old French word bescuit originally meaning twice-baked in Latin,[n 1] also known as "cookies" in North America, are flattish bite-sized or larger short pastries generally intended to be eaten out of the hand. Biscuits can have a texture that is crispy, chewy, or soft. Examples include layered bars, crispy meringues, and soft chocolate chip cookies. German chocolate cake, a layered cake filled and topped with a coconut-pecan frosting. Cakes are sweet tender breads made with sugar and delicate flour. 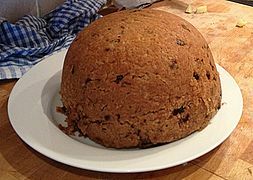 Cakes can vary from light, airy sponge cakes to dense cakes with less flour. Common flavorings include dried, candied or fresh fruit, nuts, cocoa or extracts. They may be filled with fruit preserves or dessert sauces (like pastry cream), iced with buttercream or other icings, and decorated with marzipan, piped borders, or candied fruit. Cake is often served as a celebratory dish on ceremonial occasions, for example weddings, anniversaries, and birthdays. Small-sized cakes have become popular, in the form of cupcakes and petits fours. Chocolate is a typically sweet, usually brown, food preparation of Theobroma cacao seeds, roasted, ground, and often flavored. Pure, unsweetened chocolate contains primarily cocoa solids and cocoa butter in varying proportions. Much of the chocolate currently consumed is in the form of sweet chocolate, combining chocolate with sugar. Milk chocolate is sweet chocolate that additionally contains milk powder or condensed milk. White chocolate contains cocoa butter, sugar, and milk, but no cocoa solids. Dark chocolate is produced by adding fat and sugar to the cacao mixture, with no milk or much less than milk chocolate. Candy, also called sweets or lollies, is a confection that features sugar as a principal ingredient. Many candies involve the crystallization of sugar which varies the texture of sugar crystals. Candies comprise many forms including caramel, marshmallows, and taffy. Phirni and Kheer are two of the most popular puddings in the Indian subcontinent. These kinds of desserts usually include a thickened dairy base. Custards are cooked and thickened with eggs. 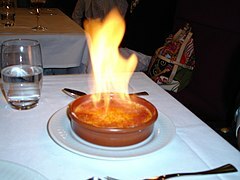 Baked custards include crème brûlée and flan. Puddings are thickened with starches such as corn starch or tapioca. 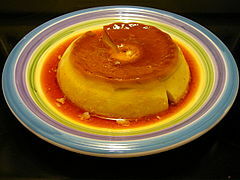 Custards and puddings are often used as ingredients in other desserts, for instance as a filling for pastries or pies. Gulab jamun topped with almond slivers is one of the most popular sweets from the Indian subcontinent. Many cuisines include a dessert made of deep-fried starch-based batter or dough. In many countries, a doughnut is a flour-based batter that has been deep-fried. It is sometimes filled with custard or jelly. Fritters are fruit pieces in a thick batter that have been deep fried. Gulab jamun is an Indian dessert made of milk solids kneaded into a dough, deep-fried, and soaked in honey. Churros are a deep-fried and sugared dough that is eaten as dessert or a snack in many countries. Doughnuts are most famous for being a trademark favorite of fictional character Homer Simpson from the animated television series The Simpsons. Kulfi inside a matka pot from India. Ice cream, gelato, sorbet and shaved-ice desserts fit into this category. Ice cream is a cream base that is churned as it is frozen to create a creamy consistency. Gelato uses a milk base and has less air whipped in than ice cream, making it denser. Sorbet is made from churned fruit and is not dairy based. Shaved-ice desserts are made by shaving a block of ice and adding flavored syrup or juice to the ice shavings. Jellied desserts are made with a sweetened liquid thickened with gelatin or another thickening agent. They are traditional in many cultures. Grass jelly and annin tofu are Chinese jellied desserts. 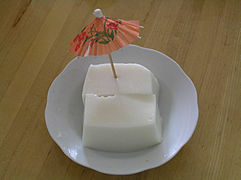 Yōkan is a Japanese jellied dessert. 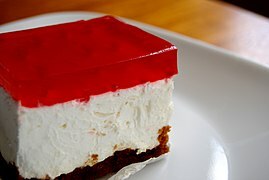 In English-speaking countries, many dessert recipes are based on gelatin with fruit or whipped cream added. Pastries are sweet baked pastry products. Pastries can either take the form of light and flaky bread with an airy texture, such as a croissant or unleavened dough with a high fat content and crispy texture, such as shortbread. Pastries are often flavored or filled with fruits, chocolate, nuts, and spices. Pastries are sometimes eaten with tea or coffee as a breakfast food. Pies and cobblers are a crust with a filling. The crust can be either made from either a pastry or crumbs. Pie fillings range from fruits to puddings; cobbler fillings are generally fruit-based. Clafoutis are a batter with fruit-based filling poured over the top before baking. Tong sui, literally translated as "sugar water" and also known as tim tong, is a collective term for any sweet, warm soup or custard served as a dessert at the end of a meal in Cantonese cuisine. Tong sui are a Cantonese specialty and are rarely found in other regional cuisines of China. Outside of Cantonese-speaking communities, soupy desserts generally are not recognized as a distinct category, and the term tong sui is not used. Dessert wines are sweet wines typically served with dessert. There is no simple definition of a dessert wine. In the UK, a dessert wine is considered to be any sweet wine drunk with a meal, as opposed to the white fortified wines (fino and amontillado sherry) drunk before the meal, and the red fortified wines (port and madeira) drunk after it. Thus, most fortified wines are regarded as distinct from dessert wines, but some of the less strong fortified white wines, such as Pedro Ximénez sherry and Muscat de Beaumes-de-Venise, are regarded as honorary dessert wines. In the United States, by contrast, a dessert wine is legally defined as any wine over 14% alcohol by volume, which includes all fortified wines - and is taxed at higher rates as a result. Examples include Sauternes and Tokaji Aszú. 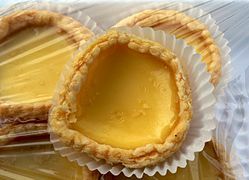 Egg custard tarts, a pastry originating from Guangzhou, China. Grass jelly is a jelly-like dessert eaten in several Asian countries. Throughout much of central and western Africa, there is no tradition of a dessert course following a meal. Fruit or fruit salad would be eaten instead, which may be spiced, or sweetened with a sauce. In some former colonies in the region, the colonial power has influenced desserts – for example, the Angolan cocada amarela (yellow coconut) resembles baked desserts in Portugal. Bubble tea is famous for its varieties of flavors with bubbles and jellies. Dessert nowadays are made into drinks as well, such as Bubble Tea. It is originated in Taiwan, which locates in East Asia. 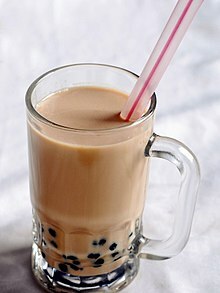 Bubble tea is a kind of dessert made with flavor tea or milk with tapioca. It is well-known across the world. 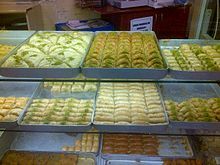 Some Turkish cuisine desserts like baklava, şöbiyet, sütlü nuriye, kalburabastı, burma kadayıf, kadayıf dolma, and badem tatlısı. In Ukraine and Russia, breakfast foods such as nalysnyky or blintz or oladi (pancake), and syrniki are served with honey and jam as desserts. European colonization of the Americas yielded the introduction of a number of ingredients and cooking styles. The various styles continued expanding well into the 19th and 20th centuries, proportional to the influx of immigrants. Cocadas are a traditional coconut candy or confectionery found in many parts of Latin America, made with eggs and shredded coconut. Dulce de leche is a very common confection in Argentina. In Bolivia, sugarcane, honey and coconut are traditionally used in desserts. Tawa tawa is a Bolivian sweet fritter prepared using sugar cane, and helado de canela is a dessert that is similar to sherbet which is prepared with cane sugar and cinnamon. Coconut tarts, puddings cookies and candies are also consumed in Bolivia. 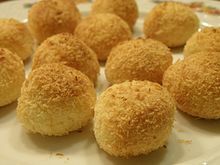 Brazil has a variety of candies such as brigadeiros (chocolate fudge balls), cocada (a coconut sweet), beijinhos (coconut truffles and clove) and romeu e julieta (cheese with a guava jam known as goiabada). Peanuts are used to make paçoca, rapadura and pé-de-moleque. Local common fruits are turned in juices and used to make chocolates, ice pops and ice cream. In Chile, kuchen has been described as a "trademark dessert." Several desserts in Chile are prepared with manjar, (caramelized milk), including alfajor, flan, cuchufli and arroz con leche. Desserts consumed in Colombia include dulce de leche, waffle cookies, puddings, nougat, coconut with syrup and thickened milk with sugarcane syrup. 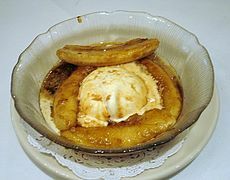 Desserts in Ecuador tend to be simple, and desserts are a moderate part of the cuisine. Desserts consumed in Ecuador include tres leches cake, flan, candies and various sweets. 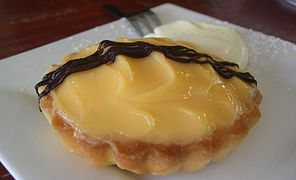 Desserts are typically eaten in Australia, and most daily meals "end with simple desserts," which can include various fruits. More complex desserts include cakes, pies and cookies, which are sometimes served during special occasions. The market for desserts has grown over the last few decades, which was greatly increased by the commercialism of baking desserts and the rise of food productions. Desserts are present in most restaurants as the popularity has increased. Many commercial stores have been established as solely desserts stores. Ice cream parlors have been around since before 1800. Many businesses started advertising campaigns focusing solely on desserts. The tactics used to market desserts are very different depending on the audience for example desserts can be advertised with popular movie characters to target children. The rise of companies like Food Network has marketed many shows which feature dessert and their creation. Shows like these have displayed extreme desserts and made a game show atmosphere which made desserts a more competitive field. Desserts are a standard staple in restaurant menus, with different degrees of variety. Pie and cheesecake were among the most popular dessert courses ordered in U.S. restaurants in 2012. Dessert foods often contain relatively high amounts of sugar and fats and, as a result, higher calorie counts per gram than other foods. Fresh or cooked fruit with minimal added sugar or fat is an exception. ^ a b "Dessert". Merriam-Webster Dictionary. Merriam-Webster Incorporated. Retrieved 15 October 2012. ^ Charlton, Anne (2005). "An example of health education in the early 17th century: Naturall and artificial Directions for Health by William Vaughan". Health Education Research. 20 (6): 656–664. doi:10.1093/her/cyh030. ^ a b c Drzal, Dawn. "How We Got to Dessert". The New York Times. Retrieved 23 October 2012. ^ "Eating and Drinking". The Septic's Companion. Retrieved July 22, 2015. ^ Elizabeth Abbot (2010). Sugar: A Bitterweet History. Penguin. ISBN 978-1-590-20297-5. ^ a b c d e Kondl, Michael (2011). Sweet Invention: A History of Dessert. Chicago IL: Chicago Review Press. ISBN 978-1-55652-954-2. ^ "Lessons From History: Fruit is a Dessert". Nourishing Gourmet. Retrieved July 21, 2015. ^ electricpulp.com. "HERODOTUS iii. DEFINING THE PERSIANS – Encyclopaedia Iranica". www.iranicaonline.org. Retrieved 7 October 2017. ^ "Internet History Sourcebooks". sourcebooks.fordham.edu. Retrieved 7 October 2017. ^ Newcomb, Tim. "Happy Pi Day! 8 Notable Pi(e)s in History". Time. Retrieved July 20, 2015. ^ "Cupcake History". Crazy About Cupcakes. Archived from the original on 2 December 2014. ^ Mintz, Steven. "Food in America". Digital History. Archived from the original on 12 May 2013. Retrieved 18 October 2012. ^ "Baking Flour Facts". TLC. Discovery Communications, LLC. Retrieved 23 October 2012. ^ Brien, Donna Lee (May 2012). "Powdered, Essence or Brewed? : Making and Cooking with Coffee in Australia in the 1950s and 1960s". M/C Journal. 15 (2). Archived from the original on 22 March 2015. Retrieved 25 July 2015. ^ Emoff, Katherine (21 October 2014). "Alcoholic Sweet Treats Turning Dessert Into a Party". ABC News. Archived from the original on 18 March 2015. Retrieved 25 July 2015. ^ Bloom, Carole (2006). The essential baker : the comprehensive guide to baking with fruits, nuts, spices, chocolate, and other ingredients. Hoboken, NJ: Wiley. p. 672. ISBN 978-0-7645-7645-4. ^ "Why Homer Simpson's pink doughnut is the ring to rule them all - CNET". Retrieved 7 April 2017. ^ Breton, Félicien. "The 7 major types of white wines - French Scout". ^ Wilson, Ellen Gibson (1971). A West African cook book. Distributed by Lippincott, Philadelphia,. M. Evans. p. 171. Retrieved 20 July 2015. ^ a b Roufs, Timothy G.; Roufs, Kathleen Smyth (2014). Sweet Treats around the World: An Encyclopedia of Food and Culture. Santa Barbara, California: ABC-CLIO. pp. 60–61. ISBN 978-1-61069-221-2. ^ Classic Asian cakes and desserts : quick and delicious favorites. Singapore: Periplus. 2003. p. 3. ISBN 0-7946-0213-4. Retrieved 20 July 2015. ^ "Bubble Tea History". www.bubbleteasupply.com. Retrieved 2017-09-21. ^ Roufs, T.G. ; Roufs, K.S. (2014). Sweet Treats around the World: An Encyclopedia of Food and Culture. ABC-CLIO. p. 8. ISBN 978-1-61069-221-2. ^ a b c Roufs, T.G. ; Roufs, K.S. (2014). Sweet Treats around the World: An Encyclopedia of Food and Culture. ABC-CLIO. p. 44. ISBN 978-1-61069-221-2. ^ Freyre, Gilberto. Açúcar. Uma Sociologia do Doce, com Receitas de Bolos e Doces do Nordeste do Brasil. São Paulo, Companhia das Letras, 1997. ^ a b Burford, T. (2005). Chile: The Bradt Travel Guide. Bradt Guides. Bradt Travel Guides. p. 87. ISBN 978-1-84162-076-3. ^ Cathey, K. (2011). Colombia – Culture Smart! : The Essential Guide to Customs & Culture. Culture Smart!. Kuperard. p. 132. ISBN 978-1-85733-549-1. ^ Woods, S. (2012). Bradt Colombia. Bradt Travel Guide Colombia. Bradt Travel Guides. p. 99. ISBN 978-1-84162-364-1. ^ a b Greenspan, E. (2011). Frommer's Ecuador and the Galapagos Islands. Frommer's Complete Guides. Wiley. p. 31. ISBN 978-1-118-10032-5. ^ a b Burckhardt, A.L. ; Germaine, E. (2004). Cooking the Australian Way. Easy Menu Ethnic Cookbooks 2nd Edition. Ebsco Publishing. p. 53. ISBN 978-0-8225-1697-2. ^ Bellis, Mary. "History of Ice Cream". About.com Inventors. Retrieved 23 October 2012. ^ Story, Mary (Feb 2004). "Food Advertising and Marketing Directed at Children and Adolescents in the US". PMC. US National Library of Medicine. 1: 3. doi:10.1186/1479-5868-1-3. PMC 416565. PMID 15171786. ^ "About Food Network". Food Network.com. Food Network. Retrieved 23 October 2012. ^ Top desserts ordered in restaurants 2012. Technomic, Inc. September 2012. Retrieved 3 December 2013. ^ Goff, Corinne. "5 Easy To Make, Good for You Desserts". FitDay. Retrieved 23 October 2012. Dodge, Abigail J.; et al. (2002). Dessert. Simon & Schuster Source. ISBN 0-7432-2643-7. Mesnier, Roland (2004). Dessert University. Simon & Schuster. ISBN 0-7432-2317-9.